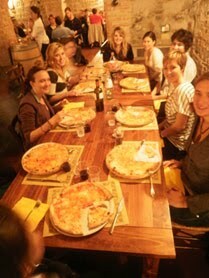 Another Tuesday, another night of great pizza at the Il Paiolo pizzeria in Perugia. Il Paiolo, a 5-star rated pizzeria on the popular Italian foodie site 2spaghi.it (similar to ChowHound.com, for those that are familiar), actually used to be the headquarters of the Perugina chocolate factory before it was industrialized and moved outside the city walls. In fact, on the upper floors of the edificio in which the pizzeria is housed, you can still see the enormous, meter-wide cookie sheets originally used by the Perugina bakers! It’s great to be able to live in an ancient Etruscan city and nearly interact with the various stages that it has passed through, all while eating some incredible pizza made in a forno a legno (wood-fired oven). There’s still one more pizza night for everyone to get together and eat, so keep December 7th clear on your calendars!